Emergency workers were on scene of an accident caused by a wrong-way driver that killed two people and closed Route 495 northbound Wednesday afternoon. Two people were killed Wednesday when a wrong-way driver crossed a median and crashed into three vehicles on Interstate 495, State Police said. Shortly before noon, troopers responded to the crash, just south of Exit 42A in Lawrence. According to a preliminary investigation, a 2016 Kia Sportage, which was driven by a 38-year-old woman from Lawrence, was traveling on the southbound side of the highway when the driver drove through the median onto the northbound side. It was not immediately clear Wednesday afternoon what caused her to cross the highway. “We really can’t speculate right now,” Lawrence Deputy Fire Chief Kevin Loughlin said Wednesday afternoon. On the northbound side of the interstate, she sideswiped a 2004 Ford F350, which was driven by a 59-year-old Dracut man, who escaped the crash unscathed. The Kia then slammed into a 2003 Honda Pilot head-on, State Police said. The Pilot was driven by a 55-year-old woman, and a 56-year-old man was riding in the vehicle as a passenger. Both were from Lawrence. The man was pronounced dead at the scene, as was the driver of the Kia. The driver of the Honda was taken to Lawrence General Hospital with serious injuries, State Police said. From that hospital, she was taken via helicopter to a Boston hospital, Loughlin said. After striking the Pilot, the Kia crashed into a 2016 Toyota Rav4 that was driven by a 58-year-old woman and had a 27-year-old woman riding in it as a passenger, both from Andover. Both women were taken to Lawrence General with injuries that were not life-threatening. 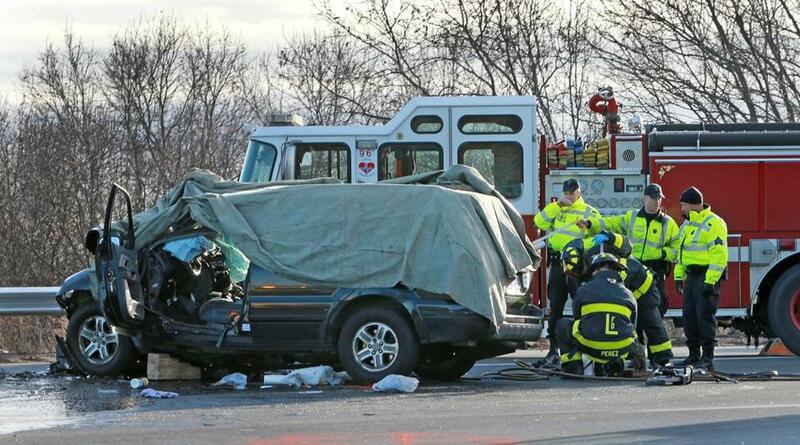 The crash happened “directly on the” Andover/Lawrence line, State Police said. In the aftermath of the crash, all lanes on the northbound side of the highway were closed to traffic for about three hours. All lanes were reopened shortly before 3 p.m., authorities said. The names of those killed in the crash were not released Wednesday. The investigation remains ongoing.